If you have a romantic soul, you instinctively sense the importance of location. Some of the most charming weddings around the world are held outdoors. The magical ambiance of idyllic beaches, scenic gardens, or enchanting forests can imbue your special day with joy and contentment. Here are 10 things to be aware of at an outdoor Ceremony. Wet weather is enough to test anyone’s temper on a good day. When it occurs on the most important day of your life, the results can be disastrous. So, make sure you’re prepared. If your area is known to be rainy during certain times of the year, bring umbrellas and boots. Make sure your guests are similarly prepared. If you’re thinking of getting married in the winter-time or you live in Seattle, be prepared for hail. 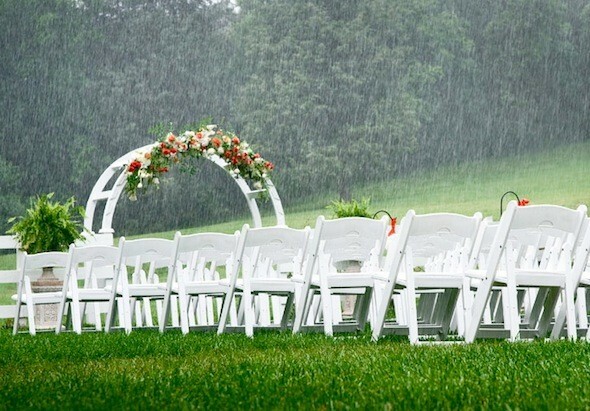 Again, make sure you and your guests bring umbrellas, raincoats, and boots. Above all, consider the temporary weather hiccup a good sign. Hail on your wedding day will be a unique conversation starter for years to come. If your perfect day will be spent on a tropical beach, prepare for the eventuality of high winds during the ceremony. It’s a great idea to have tents set up so that the ceremony can continue without problems when the winds pick up. Thinking of getting married in the Arizona desert, the Mojave desert, or the California Salt Flats? Think very carefully. There’s hot and then, there’s desert hot. If possible, make sure that the ceremony is short, and usher your guests to air-conditioned tents immediately after your vows are exchanged. Providing a variety of refreshing beverages will also go a long way towards cooling everyone down. Winter weddings are the stuff of fairy-tales. The weather may be icy cold, but you and your guests can stay toasty. Consider setting up heated tents, where guests can warm up, drink hot beverages, and relax. Tell your guests to dress warmly for the ceremony, and above all, be sure to let them know how long the actual ceremony will take. If you’re having an outdoors wedding, microphones are a necessity. Your celebrant will need one and so will any singers who will be performing at your reception. For outdoor weddings, cordless microphones are a popular option. Just remember to account for the fact that dead zones or obstructions between transmitters and receivers can contribute to signal blockages. Cordless microphones are popular for their ease of use and the mobility they provide the user. Make sure microphones are plugged into their chargers when not in use. This cuts down on the probability of rude interruptions in the middle of a great performance. Although an experienced wedding singer will likely go with the flow, it’s best to reduce embarrassing pauses in the music. Background noise can destroy special moments, so make sure you have software on hand to remove background noises on outdoor video shoots. Bear in mind that although software can remove most ambient noise, it isn’t as easy to remove the sounds of jet engines, planes, or machinery. If you’re like everyone else, you’re not exceptionally thrilled with the possibility of onlookers appearing in random wedding photos. So, ask a couple of ushers to keep a lookout for nosy onlookers while you’re taking pictures. Make time allowances for guests to get from the ceremony site to the reception venue. Post signs along the way, if possible. You can also consider handing out nifty maps at the end of the wedding ceremony as your guests make their way towards the reception tent. Regardless of the challenges you face on your wedding day, there’s nothing like music to improve everyone’s mood. If you’re looking to find the best wedding singers in Australia, look no further than the Lily Road Band, the best wedding entertainment provider down under. Choose your favourite wedding singers to front either the Sydney wedding band or Melbourne wedding band.